An awesome activity for an adventurous hen! 1 hour of private boat at the sea! 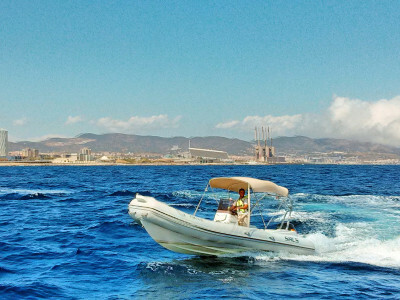 Make Some Waves – Ride a Speed Boat! Is your hen the adventurous type, and you’re looking for an awesome water transport for her hen do in Barcelona? You can’t get any better than a private speed boat! On this thrilling ride your group of between six and 11 will feel the wind blow through your hair, with Barcelona’s glistening coast in perfect view! With the sun working wonders on your tan, you can take a break from the warmth with a refreshing swim in the cool waters, and take in the stunning Barcelona skyline from the sea. Be sure to remember your swimsuit, towel and sun cream, as well as a pair of flat shoes with soles that won’t mark the speed boat! We take care of insurance, safe storage of your valuables and associated costs, which are all included in the price. If you would like extra time on the speed boat, no problems! Get in touch and we can help you to arrange the perfect amount of time.